It’s hard to believe it’s already this time of year again… Here at the LaurenConard.com headquarters, we have holiday shopping on the brain! Which can only mean one thing: gift guides. We get excited to put together our gift guides when the holidays are around the corner, and this year is no different. We have some pretty amazing guides for you all to look forward to (one for the cocktail connoisseur, one for the jetsetter, one for the pet owner, just to name a few! ), but today we’re kicking things off with a selection of gifts you can give your best girlfriends. 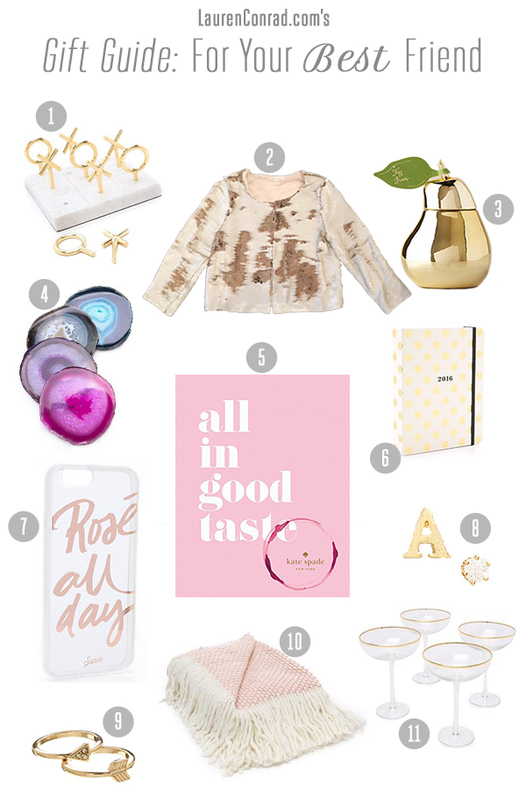 These gift ideas are perfect for your bestie, your sister, or any special friend in your life. This gold and marble coffee table-topper is a stunning décor statement piece, and a fun activity to do with your bestie (glass of wine in hand, of course). Splurge Alert: This Paper Crown jacket comes at a higher price point for a holiday gift, but the gorgeous sequins and quality craftsmanship make it a gift perfect for the leading lady in your life. This pretty pear will look perfect in any room of the house, and it smells heavenly too. Because regular old coasters are just boring. We were sold just looking at the cover of this girly coffee table book, but when we flipped through the pages, we knew it was a must-have this year. Agendas are a great gift to give at the beginning of a new year. The gold polka dots on this one have us swooning. Only your best girlfriends (or mom, or sister) know the importance of what a glass of rosé can do at the end of a long day. And this feminine phone case says it all! For your jewelry-loving friend: This personalized set of ear candy is equal parts sparkly and sweet. If you’re on a budget this year, these gold crystal arrow rings are just what the doctor ordered. They come at a really affordable price point, and any one of your best friends will love wearing them. We adore the cozy feel and cute color scheme of this throw blanket. …Because the best champagne toasts are the ones made with girlfriends, right? Which of these gifts are you buying for your friends this year?